Weather vs. climate, and what's it to you? Have a question for the climate scientists? Do you have questions about what it’s like to be a climate scientists? Ask Pushker Kharecha, and keep your eyes on Science Buzz for the answer! "Carbon dioxide (CO2) is the main culprit in the story of how humans are changing Earth's climate." Carbon is essential to every living thing, and part of every breath you take. But when we burn the carbon in fossil fuels to power our cars and buildings, or cut down forests to replace them with cattle pastures or crops, we release lots of carbon dioxide (CO2) into the atmosphere. And the more CO2 and other “greenhouse gases” in the atmosphere, the warmer Earth’s global climate will get. 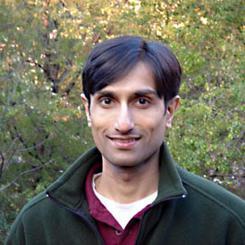 Pushker Kharecha, a climate scientist at NASA’s Goddard Institute for Space Studies (GISS) at Columbia University in New York City, studies carbon’s role in changing Earth’s climate. He follows carbon as it moves through the land, air, water and living things to learn how we are changing Earth’s natural carbon cycle and increasing the planet’s temperature. These changes increase the risk of climate impacts experienced by people around the world.